pajamas | Oh Look! It's A Blog! Whimsical is open – if you haven’t gone yet, you should! You’re going to be somebody’s favorite story someday. Addams recently released a new boyfriend shirt – I have been waiting for a Maitreya fitted one for a while ( EXCITED NOW). Paired it with the new’ish hair ( I am slowwwww ) from Oleander at Collabor88 for the perfect lazy look. I need more ponytails in my SLife. I am really sleepy today. It seems that has rolled over into my in world attire/blogging… because well… pajamas! I really love the Dead Dollz pajama sets at The Epiphany. The one I am wearing above is just one of several options – there are lingerie and t-shirt sets too. I am back to being a busy bee with the holidays approaching (and my birthday was yesterday, wahhhh getting older). However I am still going to try to squeeze in several more posts before Christmas. 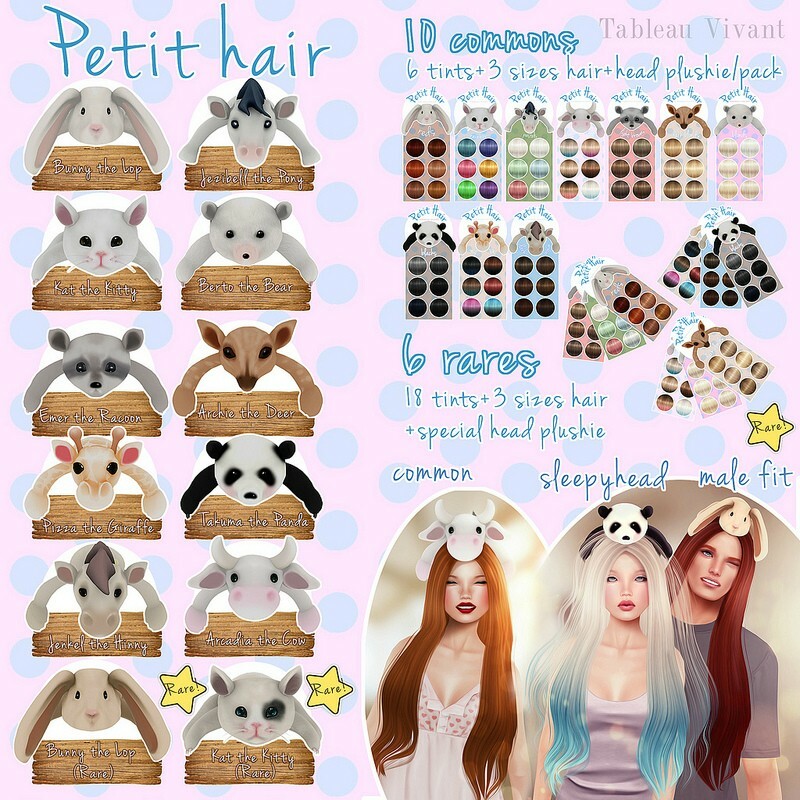 Tableau Vivant is releasing an ADORABLE hair for The Arcade – The Petit hair with head plushies! * all of the official ads for all vendors can be seen here: The Arcade Shopping Guide – March 2014. Petit hair in three sizes. 1 hud with 6 tints. 3 hud with 6 tints (18 tints in total). 1 special color head plushie. * In addition there are also RARE combinations to be won which include the sleepy head hair version and the male fit. The plushies are attached to the hair so you are able to wear the hair without the plushie as well as wear the plushie individually. My lingerie is also new from 1 Hundred – available currently at the Bodify event. That’s all from me – on to the details!